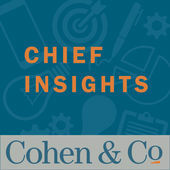 Cohen & Company proudly offers two podcast series designed for business owners, C-level executives, board members and other top decision makers. Each series addresses key business and financial issues that impact private companies and those in the investment industry. Offers business best practices and opportunities from entrepreneurial-minded CPAs, consultants and specialists. Offers a high-level understanding of tax reform’s many opportunities and areas of impact from seasoned tax professionals.